So you’ve decided to try out vaping? Congratulations! And thank heavens because you’ve finally found the right place to start your journey. If you are new to vaping, there’s a high chance you’ll find it confusing. Why? Because there are dozens of products in the markets and narrowing them down to the top vape starter kits, for instance, is never going to be another walk in the park. Now, rather than buying each of these separately, a starter kit combines all of them. Besides, buying them separately when you are a beginner is never a good idea. A vape starter kit is simple, inexpensive and designed to suit all beginners. 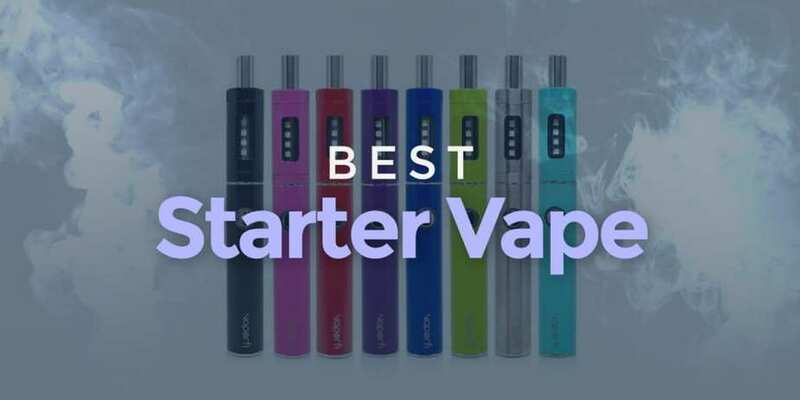 So we’ve rounded up the best starter kits for vaping and we trust you’ll definitely find something that suits you here. When you want to make a swift transition from smoking to mouth-to-lung vaping, the VaporFi Pro3 is the go to starter kit. Just like a cigarette, it lets you make tight draws and also comes with superior coils designed to deliver remarkable flavor. It’s also convenient and easy to use. It features a 1000 mAh battery which can reliably power each of your 2.5 ml tanks. Inclusion of a top fill design means you’ll easily fill up your tank without spilling. Also, it's important to note that each tank comes with already installed 2.0-ohm atomizer and a powerful 100mAh battery. Now, if you wish to get a nice throat hit with this vape kit, make sure you use an e-juice that comes with at least 12 mg of nicotine. Meanwhile, if you choose to buy it, you’ll be lucky to pick from a range of 8 stylish colors. All in all, we recommend this one as the best vape kit a newbie could ask for. Sometimes you will buy one of those best vaping kits but soon enough you will feel uninterested in them due to frequent exposure or indulgence. Well, Eleaf’s iStick Pico 75w TC isn’t one of them. What’s so good about it is that it has a temperature control mode and this is great because it lets you use as many coil types as possible. Leveled up from the Pico 25w and the iStick 50w, power is single-handedly offered by its interchangeable 18650 cell which can deliver up to 75w. It also has a display screen from which you can adjust numerous features including the wattage and temperature limit and also the temperature coefficient resistance. You can as well reverse the display screen if you wish by holding down the – and + buttons simultaneously. 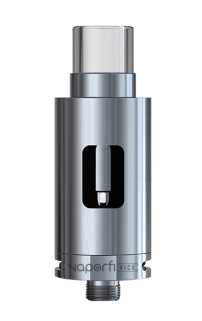 Its tank, the Melo III sub-ohm tank, has a capacity of 2ml and measures 22mm in diameter. It utilizes kanthal coils, one a 0.3 ohm while the other a 0.5-ohm coil. You can as well use Aspire Atlantis-style heads. 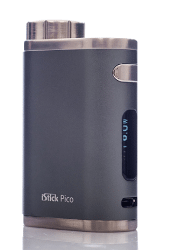 iStick Picko 75w is ideal for both novices and pro vapers. What strikes first when you look at this starter kit is the stellar design in which it comes. In fact, everything in this kit is simply enticing. The two EX series batteries included come in different shades. Aside from that, there’s the two colorful 25 ml containers that carry the v2 platinum e-liquid and also an attractive pack of Ex Series blanks that come in sets of three. 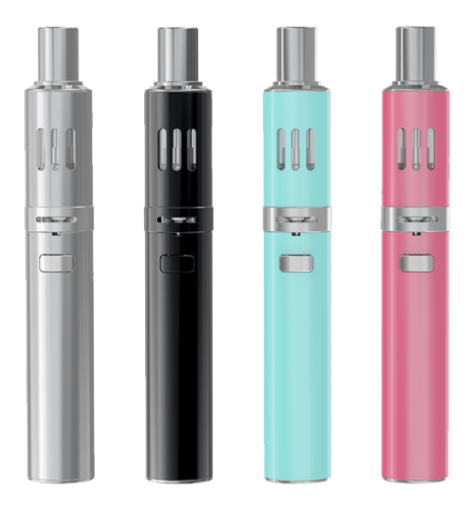 What’s great about its e-liquid kit is the mini clearomizers that are able to deliver remarkable amounts of vapor, something not so common in many small vape kits. Vapers who dislike refilling the vape tanks every other time will also find comfort in the product’s cartomizer kit. The battery life is on par with the best and besides that, you will also get to enjoy its excellent charger switching options and power switch functions as well. Generally, the kit is ideal both for new vapers as well as ex-smokers because it delivers a decent throat hit and on top of that you get an affordable nicotine fix. As you begin to vape, it’s obvious that you will be attracted to kits that are easy to use. Ego one kit is so simple that it even lacks those fancy display screens, sophisticated buttons, complex menus and the many other features that nearly every beginner vaper find confusing. Its battery capacity stands at 2200 mAh. 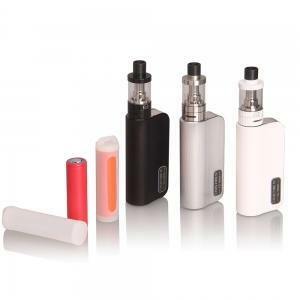 Also included in this kit is a battery tube and an atomizer tank. All you have to do is bring your e-juice and you're set to go. Speaking of e-juice, its tank can take up to 1.8 ml of e-juice. However, if you are one of those folks who vape all day, then you’ll have to refill your tank often. Included with the atomizer are two extra coil heads: one 0.5-ohm coil and the other 1.0hm coil. Whereas this may not sound good to a pro vaper, a new beginner will find this just great for the start. The o.5 ohm will be a great choice to those who need direct to lung inhales while the 1.o-ohm coil will be perfect for those who need a great mouth to lung vaping experience. You also have the option to use the rebuildable CLR atomizer heads. Joyetech’s eVic VTC mini is one of those kits you can use since your early days all the way through the time you consider yourself a pro-vaper. 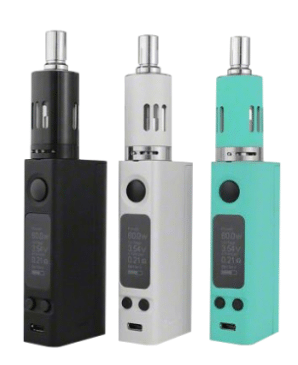 Ever heard of the famous Joyetech eVic VTC? Well, its mini version is here to carry on the legacy. Power is generated from its single replaceable 18650 battery, which has the capacity to deliver a maximum of 60 watts. Want to stretch this wattage? Simply hook the device to your computer and give it a software upgrade. That will stretch the power output to 75 watts. And bear in mind that all this power is regulated as well. You can as well enjoy a temperature controlled vape from this device, something not so common in starter kits of its class. The device comes already installed with a Ni-100 coil head and besides that you have the option to utilize the included Ti-coil head. Its eGo one Mega atomizer has a capacity of 4.0 ml. Generally, it’s one of the best vaping starter kit perfect for starters because it has all that one needs to start vaping well. 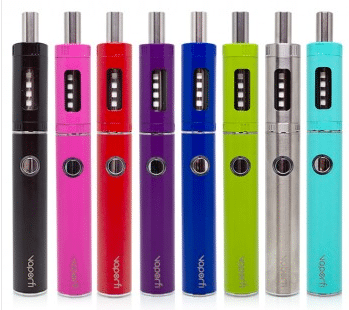 Joyetech is a great brand for beginners so take a look at other Joytech's products I would recommend: Cubox AIO and EVic. 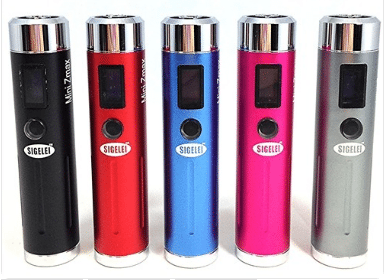 Sigelei Mini Zimax shares the pride of being both a variable wattage as well as a variable voltage vaporizer mod. On its side, it has an OLED display screen that displays several configurable stats like battery voltage, set voltage, and atomizer resistance. What’s so good about it is that its crisp and the text displayed can be read without straining the eyes. When it comes to batteries, you have the option to go for a single 18650 battery or dual 18350 batteries. If you want to drive up the amperage loads to enhance the device’s performance, it’s recommended to use dual batteries. It's also important to note that it has eGo and 510 thread which means it’s able to accommodate both eGo and 510 threaded atomizer tanks. You can switch the variable voltage between 3.0 volts and 6.0 volts. This means that you have the freedom to use it with clearomizers as well as dual coil tanks which actually require more voltage. Something else you will also love about this kit is that it’s made of out stainless steel which implies that it has been designed to last longer. To describe its design simply, it’s a compact and colorful vaporizer kit. VaporFi’s Vice Starter kit is a great pick for those looking for an easy and fun way to try sub ohm vapin﻿g. Design-wise, it’s slim and super sleek. If you really want to get the most out of this device, be sure to use it with the right/recommended juice. Both its tank and body are made out of stainless steel. The tank can take up to 2.5 ml. As for the atomizers, its tank comes already installed with a sub-ohm atomizer but on top of that, you have a 1.2-ohm optimizer and another 0.5-ohm optimizer. The atomizers are all replaceable and if you wish, you can buy extra coil heads. 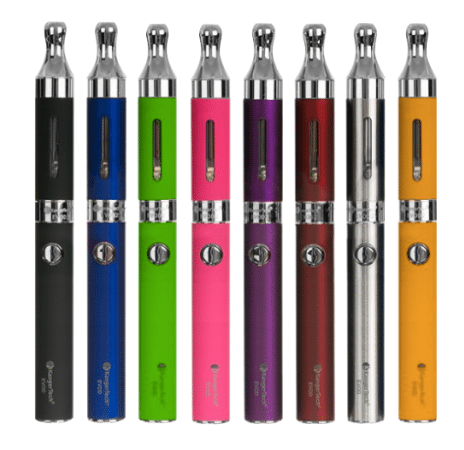 Its 2200 mAh battery has great battery life and can last up to an entire day when one is using the 1.2-ohm atomizer. More important to note is that the Vice Starter kit can deliver massive clouds of vapor especially when used with the 0.5-ohm atomizer. Briefly, you will get to enjoy its tasty and clean vape. Want something that will fit nicely in your pocket? The Ego One CT kit is a pretty good starter vape. Besides being small, it’s portable and ideal for beginners who don’t wish to attract much attention to themselves. The product comes in two different options. 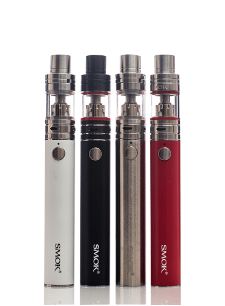 If you intend to vape all day, there’s the XL option which has a tank capacity of 2.5 ml and a 2200 mAh battery. And if you are an average vaper, the lighter version will suit you. It has a tank than can take up to 1.8 ml of e-liquid plus an 1100 mAh battery. It also features an adjustable airflow and two coils: 0.5-ohm and 1.0-ohm coils. The first coil is suited for sub ohm vaping/direct to lung vaping while the latter is perfect for mouth-to-lung vaping. Advanced features include a variable wattage mode that monitors your coil’s resistance so as to regulate the wattage, a CT titanium mode, and also a CT ni200 nickel mode. A battery and charger are also included. Smoktech’s Stick One is a simple starter kit yet very friendly to the novice vaper who plans to vape full time. Thanks to its pen-style design, it’s small and portable which makes it decent enough for the beginner who dislikes attention. The product is offered in 2 versions: basic and plus. Each kit comes with a 2200mAh battery, but what sets them apart is the fact that basic kit’s battery is an eGo cloud battery while the plus’ kit is an eGo Cloud plus battery. In both versions you will also find are TFV4 Nano tanks. Well, if you haven’t heard about them, they make some of the best sub-ohm tanks ever due to their excellent performance. Each of them can take up to 2.0 ml of e-liquid and has a top fill design. To enhance its performance, it makes use of two coils; a 0.3 ohm micro CLp2 coil plus another 0.25 ohm micro STC2 coil. Another great feature of the Smock Stick one kit is the top and bottom adjustable airflow. 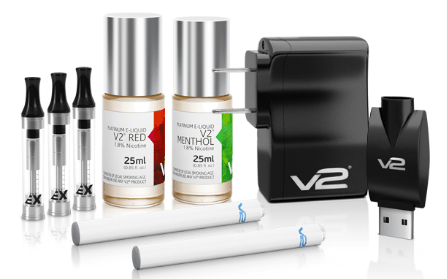 If you are out to experience great vapor production, be sure to check out this kit. 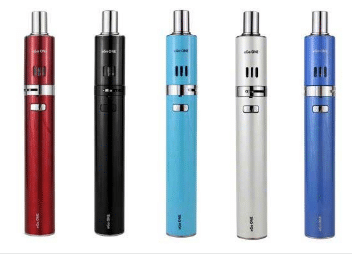 Several reasons could lead to one making the transition from smoking to vaping, but for those who do it purely for health reasons, Kangertech Evod is the best starter vape kit. Furthermore, the kit comes from a great brand, reputable for their quality vaping products. Some of the great features to expect from this starter kit include an Evod branded dual coil tank and an Evod branded twist battery. What’s more, each of them comes in a variety of colors so it’s up to you to find which one suits your taste. Beneath the tank, you’ll find 0.5-ohm dual coils. As for the capacity, the tank can take up to 2.5 ml of e-liquid. In addition, it has a 650mAh battery, but if you are willing to part with one dollar, you can get an 11oomAh battery. What’s good about the high capacity battery is that it can last an entire day when fully charged. Having understood that new vapers are mostly prone to unavoidable accidents, the kit was fitted with numerous safety features to take care of that. More recently, Kangertech has come up with the Evod 2 which features improvements on this model. Here are a bunch of other vape kits that you might also be interested in. One significant component of vaping that every beginner and veteran needs to know and understand well is the e-liquids. Whether you like it or not, you will need them and not all of them are right. In fact, you will realize that in one of the best vape starter kit we listed towards the end of our list, the manufacturer recommends that you use a specific type of juice so as to get the most out of the product. So let’s briefly talk about e-liquids. E-liquids use two standard elements: either the VG (Vegetable Glycerin) or PG (Propylene Glycol). All the different flavors we experience plus the nicotine are only added to either of this two. If you use a clearomizer set up (setups with smaller tanks), avoid high VG e-juices. In most cases, the coils are unable to handle them. Instead, go for high PG e-juices or a balance of the two as that is the only way you will have a great vaping experience. Why use High VG Juice? Can reduce device’s life span as they often clog the device. Why use High PG juice? Inhaling it is safe and recommended for people with asthma. It’s able to carry flavor more effectively. So before buying an e-liquid juice always check out the composition of VG and PG. If you decide to use e-liquids with a higher concentration of VG or PG, please ensure you drink plenty of fluids all along. From our list, you can clearly see that vape starter kits come in different sizes, shapes and also differ in their functionality. So what is the best vape starter kit for you? Well, it depends on what you are looking for. Are you after the best cheap vape starter kit, or is money no object? From our table, you can see all of them belong to specific categories. If you aren’t really sure about what you want, be sure to check out our table again as that might help you narrow down on what suits you best. More important for you to know is that our compilation of the best starter kits for vaping comes from trusted and reliable brands and are extremely user-friendly. So you won’t go wrong no matter what choice you make. Also, keep in mind the fact that you need a great e-liquid in order to get the best starter vape experience! Happy vaping! Don't forget to visit our homepage for the latest vaping deals and reviews!